The expected rush to see Monday's solar eclipse has some farmers wary. "You can only get so many people down a two-lane road," Terena Bell writes for Successful Farming from Cerulean, Ky., which will be the point of greatest eclipse, where the moon covers the sun most fully, at about 1:25 p.m. CDT. "In West Kentucky tobacco country, late August is cutting season," Bell reports. 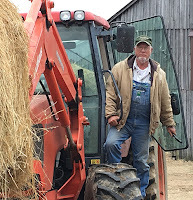 "Inability to get in and out limits how many wagons you can move from field to barn and back, which could leave crops to burn in the fields, a concern county Magistrate Mark Wells voiced at a recent town hall." David Cansler, who with relatives owns the farm with the greatest-eclipse point, predicts "a blizzard in August . . . They're just going to have to shut everything down." Christian County Judge-Executive Steve Tribble said, "you could have some crops destroyed" by people parking vehicles. 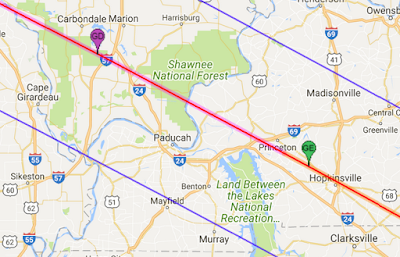 Purple marker is where eclipse will last longest, 2 minutes and 40.2 seconds. Green marker shows where moon will cover sun most fully, but for 0.1 second less. 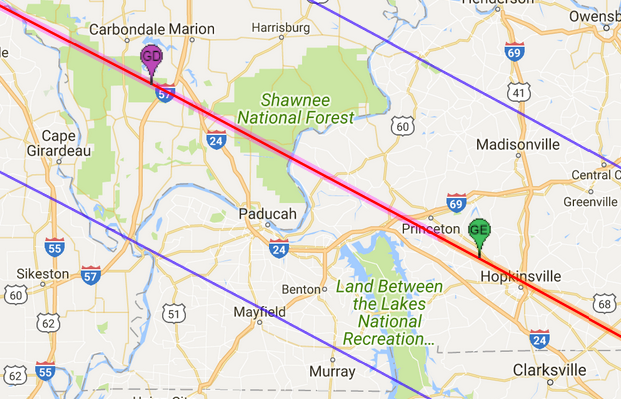 Blue lines show bounds of totality, the length of which increases rapidly as you move inward; it will last 2:20 in Paducah, 1:48 in Cape Girardeau, Mo., and 47 seconds in Central City, Ky. 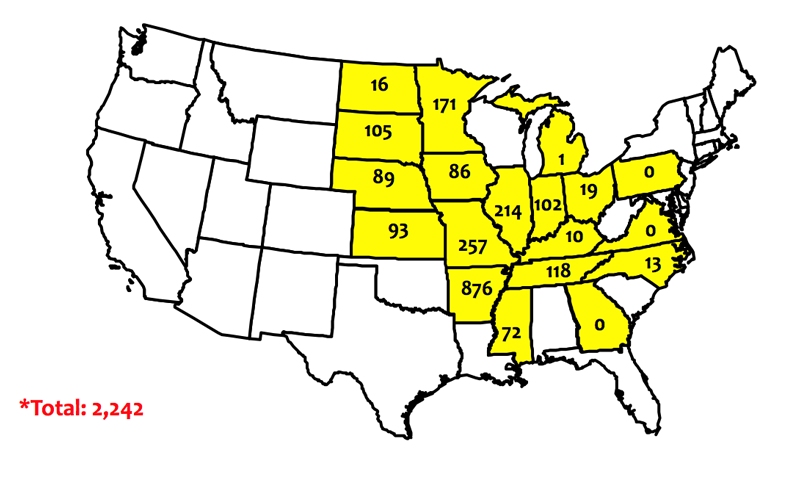 The number of soybean acres damaged by drift of a new form of Monsanto's dicamba herbicide has surpassed 3 million, according to estimates by state agriculture agencies for weed expert Kevin Bradley at the University of Missouri, who cautions, "We will likely not know the extent of dicamba damage until the end of the season." 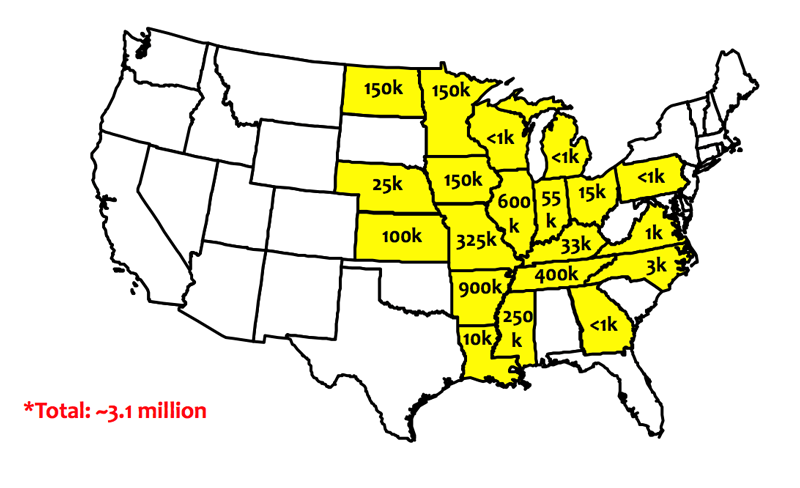 The dicamba debacle has left many farmers uncertain about what seeds to book for next year," reports Pam Smith, crop technology editor for DTN/The Progressive Farmer. 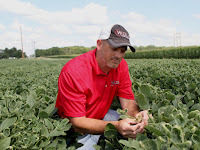 Homer, Ill., farmer Jeremy Wolf, half of whose beans were damaged, told her, "My entire summer has been consumed by trying to determine exactly how my beans got damaged and how to respond to that. I've seriously considered planting all corn next year. I do not want to go through another year like this." Gov. Greg Abbott speaks to the special session. The Texas state legislature ended an almost month-long special session on Aug. 15. For Gov. Greg Abbott, it was a mixed bag. He said the session was necessary because some state agencies would be forced to close unless the legislature passed certain laws. But Abbott had also included a 20-item agenda with a wide-ranging list of issues. His signature property tax reform bill did not pass, along with the transgender bathroom bill, the private school voucher bill, and the bill to defund Planned Parenthood. "The list of achievements included the must-pass "sunset" bills that will keep some state agencies from closing as well as proposals to crack down on mail-in ballot fraud, extend the life of maternal mortality task force, reform the municipal annexation process, limit local ordinance regulating trees and impose new restrictions on abortion," Morgan Smith and Patrick Svitek report for The Texas Tribune. One controversial item that passed would allow Texans to vote on "whether cities in large counties can annex areas outside of their limits, Alex Samuels and Shannon Najmabadi report for the Tribune. Many opponents of the bill believe the state government is trying to force state control of issues that should be left to local communities. A new study says that where you grow up has a big impact on when you're likely to marry. The findings were part of a larger study of income tax records by Stanford University economist Raj Chetty and Harvard University economist Nathaniel Hendren. They studied how growing up in different counties affected poor children. "In general, the longer a child spends growing up in a rural community, the more likely he or she is to be married at age 26. Poor children who grow up in nine out of ten rural counties will marry at rates above the national average at age 26," Bill Bishop reports for The Daily Yonder. The study also found that children who grow up in rural areas are more likely to make a higher income than average at the age of 26. Both future income and marriage rates are partially determined by what Chetty and Hendren called "neighborhood effects", which means the general characteristics of neighborhoods that can influence children for better or worse. Rural areas tend to be less segregated, have greater community involvement from churches and civic organizations, lower crime rates, higher voting rates, and better schools. Rural young people are especially more likely to marry young in communities with more two-parent families and higher church attendance. There are political differences between rural and urban counties as well. "Clinton won the counties with neighborhood effects that result in lower than average marriage rates, 59% to 36%. Trump won the half of the country living in communities where children from poor families are more likely to marry by 56% to 37%," Bishop reports. But the rural areas that promote earlier marriage and better income tend to be only incubators because there are far fewer high-earning jobs available. In other words, when those rural children grow up, they're likely to need to take their spouse and move to a more urban area that has more jobs available. Chetty and Hendren say they hope families will consider moving their children to rural areas to increase opportunity. "And governments and nonprofits could make investments in communities that would enhance those neighborhood effects that have been shown to be so beneficial, such as reducing segregation and increasing social capital," Bishop writes. Officials from the U.S., Mexico and Canada began renegotiations Aug. 16 on the North America Free Trade Agreement, a 1994 treaty that "eliminated tariffs on most goods traded among the three countries and imposed other rules in areas like intellectual property and labor standards," Danielle Kurtzleben reports for NPR. The U.S.-Canada negotiations don't seem too contentious thus far. "Canadian companies essentially want more access to American government and construction contracts," Andrew Soergel reports for U.S. News and World Report, though they are seeking several provisions on issues that may be unpopular with the Trump administration, such as gender rights and labor and environmental standards. But the atmosphere surrounding the U.S.-Mexico negotiations has been heating up for months. Those negotiations could have a major impact on the U.S. economy, as well as the state economies of the four states that share a border with Mexico, Christopher Wilson reports for Forbes. Texas, New Mexico, Arizona and California sell 55 percent of all U.S. exports to Mexico. "They facilitate an even greater portion, providing warehousing, transportation and other services for most of the 80 percent of all U.S.-Mexico trade that crosses the land border. If NAFTA were to fall apart, it would be a disaster for the thousands of companies and more than a million jobs along the border that depend on cross-border trade and tourism," reports Wilson. The current administration has a markedly skeptical view of NAFTA. President Trump criticized it in his campaign, calling it the "worst deal ever made in the history of the world." And U.S. Trade Representative Robert Lighthizer, who is representing the U.S. during the NAFTA negotiations, says he shares Trump's views on NAFTA and promises big changes in the trade deal to "to support higher-paying jobs in the United States and to grow the U.S. economy," Kurtzleben reports. He said the trade deal had "fundamentally failed many, many Americans and needs major improvement," but acknowledged that it had benefitted farmers and ranchers who were able to sell their goods in Canada and Mexico, Kurtzleben reports. U.S. corn farmers have especially benefited from NAFTA, since they were able to flood the Mexican markets with cheap, U.S. government-subsidized corn, Kirk Semple reports for The New York Times. Though corn is a small fraction of the overall $525 billion in trade between the two countries, it's of huge importance to Midwestern farmers, and Mexico has used it as a symbol of Mexico's dependence on the U.S. In response to Trump's initial threats to overhaul NAFTA completely, Mexico began exploring buying their corn elsewhere and increasing domestic production. Corn farmers, who live in areas that voted heavily for Trump, were shaken by the prospect of losing Mexico as a foreign market. Philip Gordon, who grows corn, soybeans and wheat on his Saline, Mich., farm, told Semple, "If we lose Mexico as a customer, it will be absolutely devastating to the ag economy." The Department of Agriculture says that "Mexico is not only the leading destination of American corn, but it also imports more dairy products, poultry and wheat from the United States than any other nation, and is one of the top importers of American pork, soybeans and beef," Semple reports. Supply chains for automobiles and other industries criss-cross the U.S.-Mexico border as well; some cars cross the border several times in the course of being manufactured, and eliminating the tariffs in such complicated situations has been a boon to automotive manufacturers. Avoid the term "alt-right," because it's an euphemism for groups with racist aims. It should be used only when quoting someone or when describing "what the movement says about itself." If you have to use the term by itself, put it in quotations, or call it the so-called alt-right or self-described alt-right. "Alt-left" is a phrase recently created to describe the actions of some far-left factions. Avoid using it, and follow the same rules as when using "alt-right" when you have to use it. The terms "white nationalist" and "white supremacist" are often used interchangeably, but the difference is that white nationalists say that "white people are a distinct nation deserving of protection, and therefore they demand special political, legal and territorial guarantees for whites." White supremacists, on the other hand, believe that white people are better than other races and should dominate them. Sometimes one term may be more appropriate than the other, though the groups heavily overlap. "Antifa" is short for "anti-fascist" and is a popular new term for the far-left militant groups that often oppose white supremacists at public events. The movement consciously emulates anti-fascists in Europe going back to the 1930s. Because the term is not yet well-known or clearly defined, use a definition of antifa close to your first reference. See Daniszewski's column for a more comprehensive list of related definitions and style changes. Farming lobbies largely objected to the Obama-era rule that redefined what constituted the "waters of the United States" under the Clean Water Act; a story from California shows why. Central Valley wheat farmer John Duarte has low-lying spots on his land that hold water a few times a year. Under the old WOTUS rule, these temporarily watery areas wouldn't have counted as waterways, but under the 2015 rule, they do. Duarte "has been at the center of a federal prosecution and multiple federal lawsuits against the U.S. Army Corps of Engineers because Duarte tilled vernal pools on his farm. 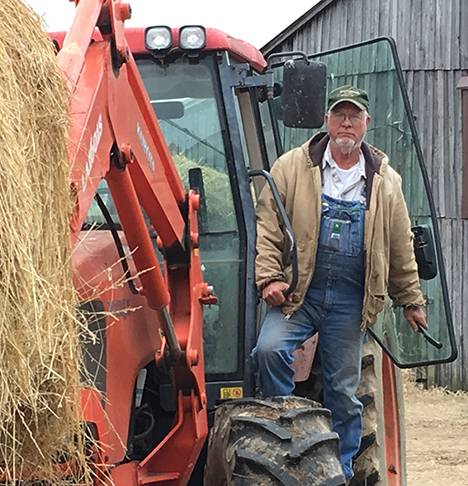 He faced about $2.8 million in fines and upwards of $33 million in mitigation costs to resolve the case," Todd Neeley reports for The Progressive Farmer. "A judge already had ruled that Duarte broke the law; the trial was going to establish the penalties," The Modesto Bee reports. Duarte has agreed to pay $330,000 in fines and to spend $770,000 to mitigate the violations. The 44 acres of his property that count as U.S. waterways must be left undisturbed for the next 10 years, though he will be allowed to use them for "moderate non-irrigated cattle grazing and weed, pest, or invasive species control," according to the consent decree he filed in federal court Aug. 15. Environmental Protection Agency Administrator Scott Pruitt has been working on repealing the rule. "Duarte’s lawyers had sought to have Pruitt testify at the trial," the Bee reports. "U.S. District judge Kimberly Mueller overruled that." "The Environmental Protection Agency says it plans to scrap an Obama-era measure limiting water pollution from coal-fired power plants. A letter from EPA Administrator Scott Pruitt released Monday as part of a legal appeal said he will seek to revise the 2015 guidelines mandating increased treatment for wastewater from steam electric power-generating plants," Michael Biesecker reports for the Minneapolis Star Tribune. Coal-fired plants flush wastewater into rivers and lakes, and it generally has traces of highly toxic metals like lead and mercury. Pruitt's letter was filed with the Fifth Circuit U.S. Court of Appeals in New Orleans, since it is now hearing legal challenges to the wastewater rule. But EPA asked the court to freeze the challenges, since Pruitt is trying to rewrite the standards. He first moved to delay implementation of the new standards in April, spurred by utilities companies that opposed them. "While that process moves ahead, EPA's existing guidelines from 1982 remain in effect. Those standards were set when far less was known about the detrimental impacts of even tiny levels of heavy metals on human health and aquatic life," Biesecker reports. If the 2015 rule were implemented, the EPA estimates that power plants would produce 1.4 billion fewer pounds of pollution per year. About 12 percent of steam electric power plants would need to spend money on bringing their plants up to compliance with the tougher standards. An upcoming webinar will discuss a recent report that provides the first comprehensive description of cancer incidence and mortality in rural and urban counties in the U.S. The report, released in the Centers for Disease Control and Prevention's Morbidity and Mortality Weekly Report, is called Invasive Cancer Incidence, 2004-2013, and Deaths, 2006-2015, in Nonmetropolitan and Metropolitan Counties – United States. The report found that people in rural counties are more likely to be diagnosed with and more likely to die from cancers related to tobacco use and cancers that could be prevented by early screening. The free webinar will be hosted by the Rural Health Information Hub, the CDC, the National Cancer Institute, and the federal Office of Rural Health Policy. It will be about an hour long, and will take place on Aug. 30 at 1 p.m. EDT. High-speed internet is required to participate, and a recording will be available on the RHI Hub website afterwards. Click here for more information or to register. In an eclipse, the moon shadows part of Earth. The first coast-to-coast solar eclipse in 99 years is coming up Monday, Aug. 21, so here's an omnibus post with tips for covering the event and links to interesting stories and helpful resources. Get there early. Experts say the eclipse could cause historic traffic jams, so allot several hours more than you think you'll need to get there and back. Be aware that cell phone coverage may be spotty and plan accordingly. Some rural areas are getting extra cell service for the day, but don't count on it. Bring supplies. Traffic and strained local infrastructure may limit access to food, water and fuel. So gas up your car before you go, and bring food, plenty of water, sunscreen, bug spray, solar eclipse glasses, and whatever recording, writing or photography equipment you need at the scene. Bring a portable phone charger if you will not be near your car, as well as backup batteries for your gear. Consider bringing a portable wi-fi hotspot if you'll be transmitting stories or photos from the scene. If you're staying near your car and can pack a little more stuff, bring a camp chair, a lightweight folding table, and a canopy tent. If you plan to photograph the eclipse with your smartphone, you can safely do it by taping the lens from a pair of eclipse glasses over the lens. If you are using professional equipment, use a solar eclipse filter (not the same as a regular solar filter). Here are some articles on how to photograph the eclipse. Never point any camera, smartphones included, at the sun until it is fully eclipsed or you'll fry the imaging sensor. Apple says a filter may not be needed for iPhones during the eclipse, but better safe than sorry. You won't need any kind of filter when the sun is fully eclipsed, but the filter needs to go back on as soon as the sun starts peeking out again. If you are photographing the eclipse, get as close to the center of the 70-mile-wide path of totality as you can; it'll give you more time to get your shots. Totality is around one minute a few miles from the edge of the path, but as much as two minutes and 30 seconds at the center. Here's a zoomable map that tells you whether you'll be in the path of totality and if so, for how long. GreatAmericanEclipse.com is a great one-stop shop for all your informational needs. It features maps of the path of totality over each state, a map of probable traffic bottlenecks, safety tips, historical eclipse information, fun facts, and an eclipse animation gallery. Eclipse2017.com is a similar site with plenty of info about the eclipse. One great feature is a state-by-state list of communities that are planning official community celebrations. It's not a comprehensive list, so do your homework, but it's a good place to start. This tool from Vox shows you what you'll see from any ZIP code in the U.S. Enter a code, and it will tell you the percentage of the sun that will be covered, show you a time-lapse animation of what you'll see and when the eclipse will be greatest, and how far you'll need to travel to get to an area with totality. If you don't already have eclipse glasses, they're scarce, but you may still be able to get your hands on a pair at a local store. You may be able to snag a pair online, but beware of fakes that will damage your eyes. Click here for a list of legitimate solar viewer manufacturers, brand names they may be sold under, and chain stores and online vendors that sell them. Here's an article from the Poynter Institute about one small-town Idaho journalist's plans to cover the eclipse while camping. NPR's plans to cover the eclipse include "22 videographers, kid reporters and local newsrooms." Another Poynter article has a round-up of how some different newsrooms are planning to cover the eclipse. University of Kentucky students are planning to live stream the eclipse from the edge of space with a solar balloon. This 10-year-old article from the Kentucky New Era is one of the earliest articles we can find about the eclipse. 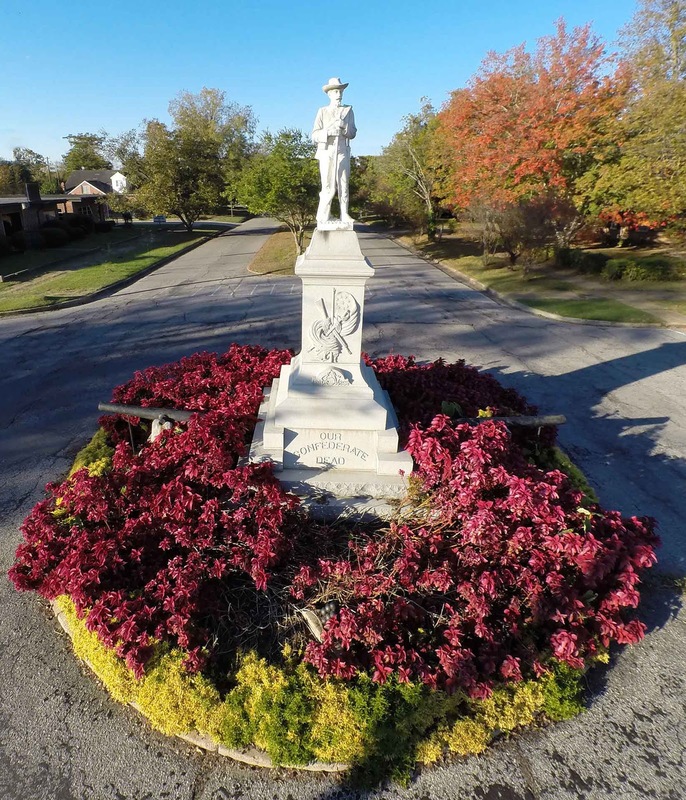 It predicted (probably underpredicted) the massive crowds expected in Hopkinsville, and revealed a few intriguing facts. For one thing, the point of greatest eclipse (where the sun is most fully covered) is not in the well-publicized Christian County seat but in the nearby community of Cerulean. That's beautifully apropos, since cerulean is a shade sometimes equated with a deep blue sky. The exact point of greatest eclipse is in a field just off Princeton Road. Another fun fact? The eclipse will happen on the 62nd anniversary of the Kelly Green Men incident, in which a Christian County family said aliens landed near their home. That's the source of the phrase "little green men." The tallest building in Hopkinsville, pop. 32,000, is a grain elevator. A video camera with a 360-degree pan has been installed on top of it for livestreaming of the eclipse, the New Era reports. A study of political polarization in a Kentucky city and a neighboring rural county aims to identify ways local news outlets and community members could engage with each other to build trust and find solutions to community issues. In its early findings, the study recommends "solutions journalism" – which emphasizes reporting on responses to problems to improve public discourse and strengthen democracy – as one method to help rebuild the public's trust in local news media at a time when many Americans perceive biased news reporting, especially from national news outlets. "From Polarization to Public Sphere" is a project of Columbia University's Tow Center for Digital Journalism. In a report, the study's co-leaders, Andrea Wenzel and Sam Ford, outline the project conducted in Bowling Green, the third largest city in Kentucky (pop. 65,000) and rural Ohio County (pop. 24,000). Ford, an independent media consultant, lives in Bowling Green. He is a research affiliate with MIT and teaches in the Popular Culture Studies Program at Western Kentucky University. Wenzel teaches journalism at Temple University in Philadelphia. In addition to political polarization in the wake of the 2016 presidential election, the study explores trust issues with the news media, how people engage through social media and in community groups and social networks, challenges that exist for local media with small newsrooms and limited resources, and opportunities for new journalism practices and strategies for community engagement. "People interpret what they find on Facebook pages or television screens from within a network of interpersonal relationships, community groups, and media – what we call a local storytelling network," Ford and Wenzel write. "We wanted to understand whether the current political environment is changing these networks and, if so, how residents in politically mixed communities are adapting their news engagement and communication practices." They wondered, "Do residents with different backgrounds and beliefs still read the same local papers, go to the same churches or social functions, or have conversations that break the ranks of the culture wars, online or off?" They chose Bowling Green and Ohio County to "understand what polarization looked like in rural communities and smaller cities where pockets of blue and purple were woven into a sea of red." The authors note that Donald Trump won 59 percent of the vote in Warren County, where Bowling Green is the county seat and home to WKU, which attracts diverse political attitudes. The city is at least 10 percent Muslim, they report; through the International Center of Kentucky, Bowling Green has resettled 10,000 refugees since 1981, including many from Bosnia. In Ohio County, 76 percent voted for Trump; many employees of a large chicken processing plant there commute from Bowling Green. Twenty-one participants in the study were invited to keep a "story diary" for one week to illuminate their media habits and their impressions of particular stories. Ford and Wenzel also conducted in-depth interviews with the participants and met with representatives of six local media outlets. The study, which began in April, revealed that political polarization affected family relationships and social networks. "Participants shared stories of lost friendships and alienated family members. One participant even reported breaking up with their romantic partner due to disagreement over Trump," Ford and Wenzel write. "For most participants, dealing with this new polarized climate in relatively small towns meant self-censorship was a necessity." As one participant said, "It's better to censor yourself and have friends from a limited pool of people around you than to not do that, to have no friends." And even though people in smaller communities with a limited number of public places might be more likely to cross paths with people who have different political views, the study indicated that "shared spaces" don't always lead to "meaningful interactions." 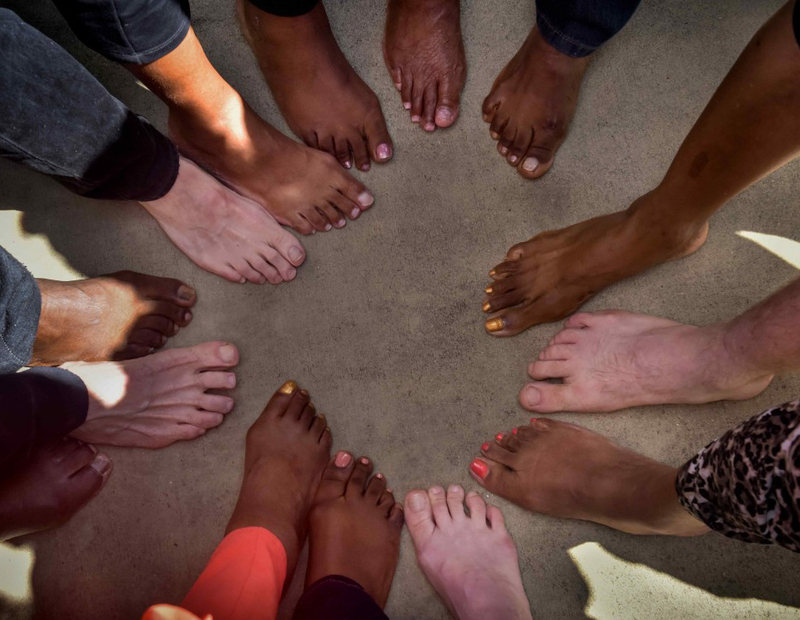 However, participants did point to connections being made at the university where students made friends with people from different backgrounds. The study's authors see opportunities to bridge political division through local issues. "For example, residents across ideological divides expressed an interest in solutions-oriented stories and followed stories about issues such as local development and tourism." Despite some distrust of the news media, a weariness with so-called negative news and tendencies to limit engagement with people with opposing political views, participants indicated they are willing to address political polarization: "Almost every resident we spoke with was open to learning more about potential initiatives that would seek to build connections across difference," Ford and Wenzel write. The researchers provide several recommendations for local news media, community organizations and foundations. In addition to more stories reported from a solutions angle, the study recommends providing a local lens to national stories; collaborations between local outlets; news media providing spaces for community engagement across divides; and getting community members involved with news organizations. Local journalism needs bolstering, but the authors note, "Much more research and work is needed to develop models for sustainable local journalism, particularly in rural communities, coming out of work like the projects in which we've engaged." A workshop for news media, residents and community groups is planned Friday to react to and continue the work outlined in "From Polarization to Public Sphere" and to develop "experiments these outlets can conduct with one another, and with outside partners, to test potential solutions," the researchers write. 'Rocky Top' turns 50 as songwriters of today gather in Gatlinburg, Tenn.
of Tennessee band, performed "Rocky Top" at the celebration. It's a big week for songwriters in Gatlinburg, Tennessee. Yesterday The Gatlinburg Inn celebrated the 50th anniversary of the writing of "Rocky Top" by Boudleaux and Felice Bryant in Room 388, and tonight the annual Smoky Mountain Songwriters Festival begins. The Bryants offered "Rocky Top" to the Osborne Brothers, a Kentucky-born bluegrass duo, who increased the tempo and made it the B side of a late 1967 single, "My Favorite Memory." Ralph Emery of Nashville's WSM had the Osbornes as guests on his radio show one night, and played "Rocky Top." The switchboard lit up, and a hit was born. 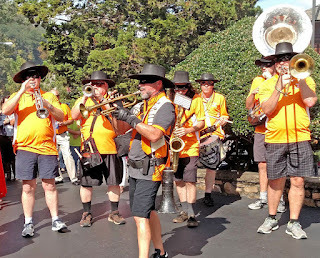 Lynn Anderson took it mainstream with a 1970 single, and in 1972 the University of Tennessee marching band started playing it, to great appreciation from Volunteer fans in Neyland Stadium in nearby Knoxville. The success of the song is a four-legged stool: the writers, who are in the Songwriters Hall of Fame; the initial performers, who improved it; the disc jockey, always an important element of country music, who saw its potential; and a continuing performance in a signature venue of a state. It is a state song of Tennessee and No. 7 on the Atlanta Journal-Constitution's "Songs of the South." The writer and relatives are part owners of The Gatlinburg Inn. "Gov. Brian Sandoval announced an agreement with a Missouri-based company Tuesday to make sure health insurance is available to 8,000 rural Nevadans who faced the loss of their coverage after Anthem Blue Cross and Blue Shield pulled out of the state's healthcare exchange," the Associated Press reports. Prominence HealthFirst, which was the only other statewide carrier in Nevada's exchange, had withdrawn earlier. Centene Corp. will partner with Nevada-based Hometown Health to ensure all areas of the state receive coverage. Centene's Nevada subsidiary will be called SilverSummit, and will provide statewide coverage through the Silver State Healthcare Insurance Exchange. About 8,000 rural residents in 14 of those counties would have had no available health insurance options in 2018. Anthem announced it was pulling out of all but the three most populous counties in Nevada because it was unsure whether President Trump would continue to pay it the cost-sharing subsidies that make it possible to offer certain low-cost plans on the healthcare marketplace. Centene is expanding in other states with similar coverage gaps: the company plans to offer policies next year in 25 Missouri counties and 20 Ohio counties that also faced having no marketplace options. "Centene Corp. covers 1.2 million customers through the exchanges and is one of the biggest insurers in that market," the Toledo Blade reports. "The insurer specializes in managing the state and federally funded Medicaid program for the poor. On the exchanges, it markets to low-income customers in areas where it has already formed networks of providers for its Medicaid business. The insurer uses narrow coverage networks that steer customers to doctors and hospitals near where they live but often exclude high-cost health care systems." The structure of the Centene plans means that patients who need expensive, specialized care may face much higher bills or not be covered for needed treatments at all. The front page of the Austin, Minn. Daily Herald on Aug. 14. More than 200 Minnesota newspapers are making a bold statement about the importance of local, credible journalism by publishing one edition of their papers this week with deliberately empty front pages. 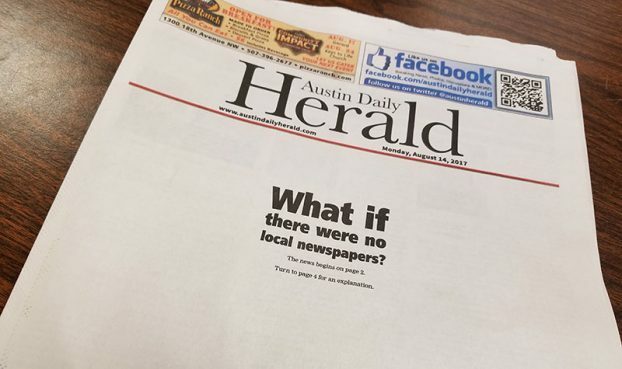 An editorial in the Austin, Minn. Daily Herald says that the "whiteout" is taking place during the Aug. 13-19 Minnesota Newspaper Week, which is part of the Minnesota Newspaper Association's year-long 150th anniversary celebration. "While alternative sources present alternative visions and alternative facts, community newspapers take credibility seriously — always have and always will, whether the platform we present on is electronic or paper," says the editorial. "Newsrooms are the furthest things from echo chambers. They are filled with professionals ready and willing to challenge each other to get the stories right. And if we stumble, we admit it to the world and press forward, fearlessly pursuing the truth and doing the best we can for our communities." Newspapers play a vital role in communities. The Minnesota Newspaper Association's member newspapers have a total circulation of more than 2.2 million readers each week, the editorial says, and points out that a 2014 survey found that 89 percent of Minnesotans accessed a newspaper in the past month. As MNA Executive Director Lisa Hill said in a press release, "In many communities across the State of Minnesota, the newspaper is the main source of local news." A school cafeteria manager from small-town Kentucky has won the Food Network Star cooking competition, and says he draws inspiration for his recipes from his rural roots. Jason Smith, 39, said in an interview with Foodnetwork.com that his style of cooking is "country bling," meaning "I take old, dying country recipes, and I bring them back to life and make them modern, elevated and fancied up a little bit," the Kentucky Press News Service and the Lexington Herald-Leader report. As the contest's winner, Smith will get his own cooking show. Smith faced off against two other finalists on the Aug. 13 finale of the 11-week cooking show before celebrity chefs Bobby Flay and Giada De Laurentiis announced him as the winner. He's no stranger to the channel, though: last year he won the Food Network's Holiday Baking Championship. The Laurel County native (who works for Carter County Schools) says he first learned to love cooking from his mother and grandmother. On the show, Smith was known for his bold fashion and colorful country sayings. When he made a mountain berry compote with nuts and a molasses ginger mousse, he told others on the show that "My mountain berry dessert is so delicious, yo tongue will slap yo brains out," the Herald-Leader reports. The show's runners and contestants loved his authenticity. "Something that struck a chord that I’ve heard Bobby, Giada and a lot of the other guests tell me a few times is, 'We really like him, because he is comfortable in his skin, he is true to himself, he is true to where he comes from,'" Smith said in a Food Network interview. "And Bobby and Giada have told me: 'Never lose that. Always tell those stories of Kentucky. Always be yourself, and you will be fine.' That’s something that I will always hold near and dear to my heart, because I am myself. I am just Jason. I’m not going to be anything else but what I am." As demand soars for foreign farm workers, legislators and President Trump's administration are taking a hard look at revamping and expanding the H2A guest worker visa program while cutting down on the number of permanent resident visas. Critics say farmers have abused guest workers by not paying them enough and providing inadequate living and working conditions. A slew of bills are addressing the issue. Chairman of the House Judiciary Committee and Agriculture Committee member Rep. Bob Goodlatte (R-Va.) "last month said it was 'well past the time to replace the outdated and onerous H2A program' and activists said they expect him to introduce a bill aimed at the program later this year," Alejandro Lazo reports for The Wall Street Journal. Another bill would create a pilot program to put each state in charge of its own guest worker program, possibly eliminating federal oversight. Rep. Rick Allen (R-Ga.) proposed a bill that favors farmers' interests by limiting the ability of legal aid attorneys to represent guest farm workers. "That bill would also move administration of the program to the Agriculture Department, change the methodology for how wage rates are calculated and eliminate the obligation to provide housing as long as a state’s governor certified that farmworker housing was available," Lazo reports. The Labor Department is trying a different tack. This year they filed a federal lawsuit—the first of its kind—against G Farms, an operation just outside Phoenix that relies on legal migrant workers. The workers contacted the Mexican Consulate about their working conditions, and the Consulate contacted the Labor Department. Some guest workers at the farm told Lazos that they had no complaints about the farm. 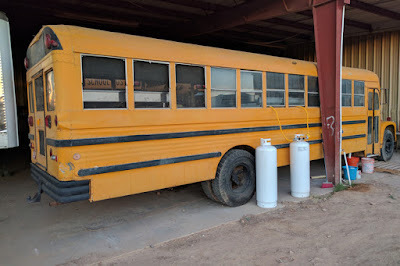 The Labor Department alleged in the suit that the farm's owner, Santiago Gonzalez, "underpaid some of its 69 workers by not offering a set, hourly wage and housed them in an 'encampment' consisting of yellow school buses and semitrailers that 'violated numerous safety, sanitation and fire code regulations,'" Lazos reports. In a first, the department won a preliminary injunction against a farm using guest farm workers. The judge ordered Santiago to stop housing his workers in the encampment and made him house them in apartments or a motel for the rest of the season. 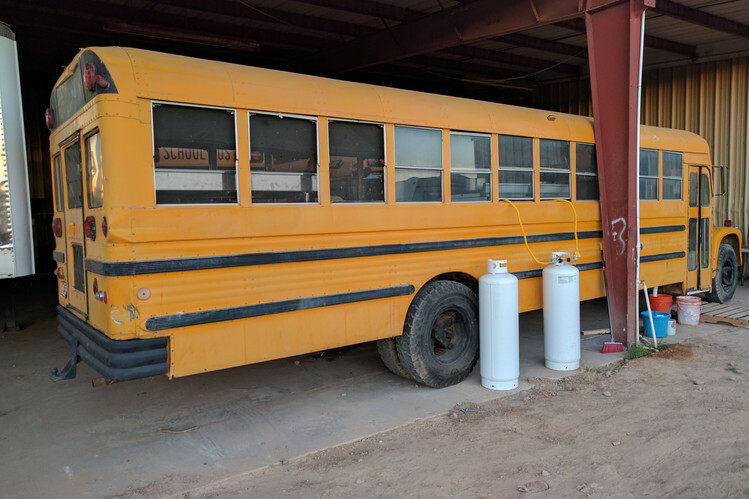 This school bus was used as a kitchen for guest farm workers at G Farms. 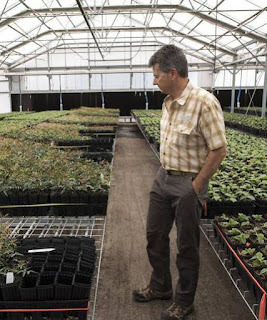 Jason Resnick, the vice president and general council for the Western Growers Association, said the lawsuit is proof that the Labor Department is on top of their game, and serves as proof that abuse is not rampant. The Western Growers Association represents the interests of farmers in Arizona, California and Colorado. But Bruce Goldstein, president of Farmworker Justice, says many migrant workers live in crowded group shelters, trailers, and sometimes even their cars. Whatever new laws are passed to improve pay or living conditions, farmers will have little choice but to comply if they want workers. Because of the Trump administration's crack-down on illegal immigration, there are far fewer workers around to harvest crops and they can be more choosy about where to work. That affects even farmers who only hire legal guest workers. Michael King, the attorney representing G Farms, says it's worth it to defend the suit because "without the H2A visa workers it is very, very hard to harvest onions and watermelons in Arizona." Monsanto prevented independent research on its new dicamba herbicide that is now being blamed for damaging millions of acres of crops, by drifting into fields unable to withstand it, reports Emily Flitter of Reuters. "Typically, when a company develops a new agricultural product, it commissions its own tests and shares the results and data with regulators," Flitter writes. "It also provides product samples to universities for additional scrutiny. Regulators and university researchers then work together to determine the safety of the product. In this case, Monsanto denied requests by university researchers to study its XtendiMax with VaporGrip for volatility, a measure of its tendency to vaporize and drift across fields." 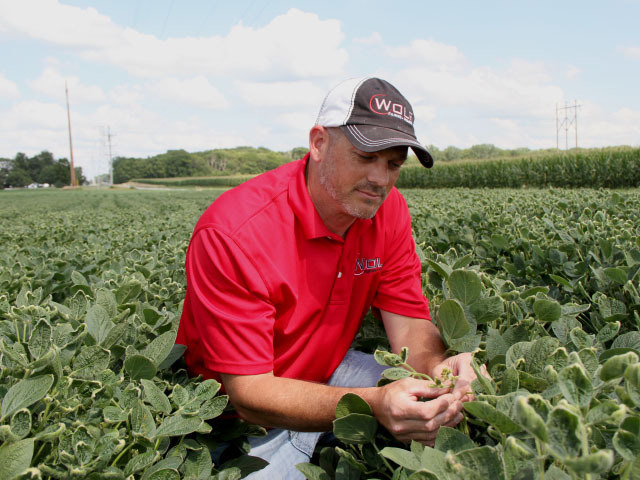 Monsanto’s vice president of global strategy, Scott Partridge, said it considered the testing unnecessary, and believed the product was less volatile than a previous dicamba formula that researchers found could be used safely. "To get meaningful data takes a long, long time, Partridge said. "This product needed to get into the hands of the growers." There’s no evidence that independent testing would have prevented the crisis, but it would have given regulators more information about the formula’s properties and whether farmers should use it, Flitter writes. It is used in combination with Monsanto soybean seeds that are resistant to it. In 2016, Monsanto agronomist Boyd Carey told the Arkansas Plant Board’s Pesticide Committee that universities were not allowed to test the new formula "for fear that the results may jeopardize the federal label," according to an official meeting summary. The Environmental Protection Agency did not answer questions from Reuters about testing on the new formula, but an EPA spokeswoman said the agency did place "time limits on the registration to allow the agency to either let it expire or to easily make the necessary changes in the registration if there are problems." With approval at the federal level, Monsanto faced less scrutiny from some states. Arkansas was the exception and blocked approval when the company declined to allow more testing. It was also the first state to ban sale and use of the new formula. 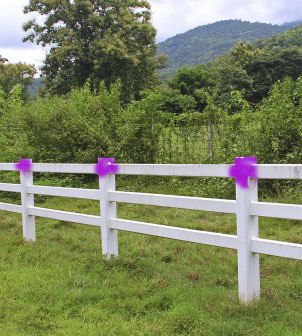 Damage that farmers attribute to it is being studied by task forces in some states. "Mexican and American officials are finalizing a water-sharing deal for the Colorado River, and a newly released summary of the accord’s key points shows negotiators have agreed on a cooperative approach geared toward boosting reservoir levels and trying to stave off a severe shortage," Ian James reports for The Desert Sun in Palm Springs, Calif. The river is shrinking because of overuse and a 17-year drought, and scientists predict that climate change will cause the river's flow to go down 35 percent or more in this century. Lake Mead, the country's largest reservoir, is only 38 percent full. All of this threatens the nearly 40 million people and 5 million acres of farmland in the Southwest that depend on the Colorado and its tributaries. The current five-year agreement expires Dec. 31; the new one, titled Minute No. 323 to the 1944 Mexican Water Treaty, builds on that and would remain in effect through 2026. It is expected to be signed this fall. Though relations between Mexico and the U.S. have been tense at times during President Trump's administration, negotiations on the river agreement within the International Boundary and Water Commission have gone smoothly. Talks began on the new agreement during President Barack Obama's administration and were mostly finished a year ago. The commission includes members of both the Mexican and American governments, and representatives of affected U.S. states have also participated in the talks. "The agreement itself has not yet been publicly released. The summary provided by the U.S. Bureau of Reclamation was presented Wednesday at a board meeting of the Imperial Irrigation District, which holds the biggest single entitlement to water from the river," James reports. The accord lays out a plan for Mexico and the U.S. to cooperate to reduce water use, secure water for environmental purposes, restore and monitor habitats along the Colorado River, and reduce the risk of Lake Mead hitting a critically low level. A too-low Lake Mead would affect not only water supply but hydroelectric power generation from Hoover Dam. The agreement also calls for the U.S. and Mexico to establish several joint working groups to focus on specific issues such as river salinity. Imperial Irrigation board members said in a memo that several agreements must be made between states, water agencies and the Department of the Interior in order for the U.S. to implement the commitments it would be agreeing to in the deal. "Those agreements include a U.S.-funded program to invest $31.5 million in water conservation projects in Mexico, including infrastructure upgrades such as concrete lining for leaky canals and other improvements to reduce water losses from distribution systems," James reports. magazine after readers of the trade publication voted it "Plant of the Year" in 2014. 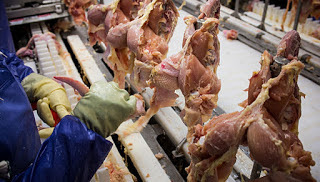 Ohio's Democratic senator is asking a major chicken processor in the state to say more about how it protects workers safety and collective-bargaining rights, following investigative reporting that he says "uncovered numerous, grave examples of unsafe working conditions at Case Farms facilities and detailed descriptions of the company's refusal to address the dangers." So said Sen. Sherrod Brown in an Aug. 9 letter to Case CEO Thomas Shelton, which continued: "When workers have tried to organize to advocate more effectively for a safer workplace, the company has retaliated against the organizers and blocked the formation of a union." Case said its reply would go directly to Brown. In response to a May story by ProPublica and The New Yorker, Case said "worker safety is an integral component" of its culture, but Brown said in his letter that statement "does not appear to square with this recent report and the company's history of serious OSHA violations" at its plants and North Carolina, where it is based. The story said Case, "which supplies Kentucky Fried Chicken, Taco Bell and Boar’s Head, has for decades relied on immigrant workers to staff its plants, which are some of the most dangerous workplaces in America," and "used their immigration status to get rid of vocal leaders, quash dissent and avoid paying for injuries. The story detailed how current immigration law makes it difficult for authorities to go after employers for hiring unauthorized immigrants, but easy for employers to retaliate against those workers," ProPublica reports. Journalists at rural newspapers can feel like David fighting Goliath when covering local top dogs, but the story of how a small Vermont news outlet took down a local hero shows that any reporter can provide dogged, comprehensive coverage of a controversial issue—and prosper. When Anne Galloway founded the nonprofit online news outlet VTDigger in 2009, she was its sole employee. But when one of Vermont's most important and beloved businessmen, Bill Stenger, announced a multi-million-dollar ski resort in 2012, she thought it was too good to be true. "It was to be built in a region known as the Northeast Kingdom — an impoverished area of the state near the Canadian border, mostly known for dairy and Christmas-tree farms — and it promised 10,000 jobs," Jessica Huseman reports for ProPublica. Galloway's small crew threw themselves into the issue: they filed suit over records, published local people's complaints that the development felt scammy, reported on Stenger's close relationship with state oversight authorities, and gained the trust of disillusioned ski-resort investors who thought things looked fishy. Their persistence paid off. After four years and dozens of stories, the Securities and Exchange Commission filed federal fraud charges against Stenger and his Miami-based business partner Ariel Quiros. The SEC likened the project to a Ponzi scheme, saying in its complaint that Stenger and Quiros "collected millions of dollars from foreign investors, pocketed some and paid for past projects with the rest," Huseman reports. "Newer projects were left incomplete, and investors were left bilked." The criminal investigation is still ongoing, but civil charges were also filed. Stenger denied guilt but reached a settlement with federal regulators over the civil charges; Quiros' civil case has not yet been resolved. Today, Galloway has a team of 11 reporters and an annual budget of $1.3 million. Almost all of it is because of the reputation they built for tough, watchdog journalism during their investigation into the ski-resort scam. Republicans could get the 50th vote they need to pass an Obamacare repeal bill through a political shuffle by President Trump and West Virginia Gov. Jim Justice. Here's the deal: Trump would name Energy Secretary Rick Perry secretary of homeland security, replacing Gen. John Kelly, who recently became Trump's chief of staff. Then Trump would name Democratic Sen. Joe Manchin of West Virginia energy secretary, and Justice would appoint a fellow Republican to fill Manchin's unexpired term. "Some congressional Democrats think it's possible, even likely," reports Harris Meyer of Modern Healthcare. "If the 49 GOP senators who voted for [Mitch] McConnell's stripped-down repeal bill last month backed the new legislation, the McConnell wouldn't need the votes of the three Republicans—Susan Collins, Lisa Murkowski and John McCain—who voted no last time." "Rep. Karen Bass (D-Calif.) said Monday morning at a health-care town hall in Chicago that she and other Democrats expect Manchin will be offered the job and he will accept it," Meyer reports. "Then, they expect McConnell to quickly launch a new drive to pass a repeal-and-replace bill. That's what Trump has been needling McConnell to do since the previous bill failed by one vote on July 28, when McCain dramatically turned his thumb down." There is also the possibility that McCain could resign from the Senate if his brain cancer progresses, Christopher Condeluci, a health-care lobbyist and former Senate Republican staffer, told Meyer. Arizona also has a Republican governor. "Ron Pollack, chairman-emeritus of Families USA, who helped build grassroots support for ACA's passage in 2010, said he is skeptical about the Manchin replacement scenario, but he cautioned that ACA supporters should remain vigilant," Meyer reports. "Even if Republicans succeed in executing this personnel switcheroo, McConnell wouldn't necessarily have 50 votes he needs to pass either the so-called skinny repeal bill or a broader repeal-and-replace package." Tom Miller, a conservative health policy analyst at the American Enterprise Institute, told Meyer, "The next hurdle is finding 50 real votes for skinny repeal when McCain isn't available to bail out up to a half-dozen or more Republican senators who voted for it very reluctantly last time." The Hill notes, "Manchin was reportedly considered for the job after Trump's election in November." Manchin, who faces a potentially tough re-election battle in 2018, represents a state that has swung sharply Republican, largely because of troubles of its signature industry, coal, during the Obama administration. Residents in a small Minnesota town near the Canadian border are embroiled in a tense debate over whether to support (and help greenlight) plans for a proposed mine that would bring jobs and income, but could threaten the town's tourism industry. Just 20 miles from the Canadian border, Ely, Minn., is a popular last stop for fishers and canoers heading to the Boundary Waters Canoe Area Wilderness. The money local businesses make from tourists is critical to the town's economy, so some residents were concerned when Twin Metals Minnesota proposed a $1.7 billion plan to extract valuable metals and minerals from lands at or near the southern edge of the Boundary Waters. The company says that "the area south of the Boundary Waters holds one of the world's largest known reserves of copper, nickel, platinum and palladium, along with modest amounts of gold and silver," Daniel Cusick reports for Environment & Energy News. 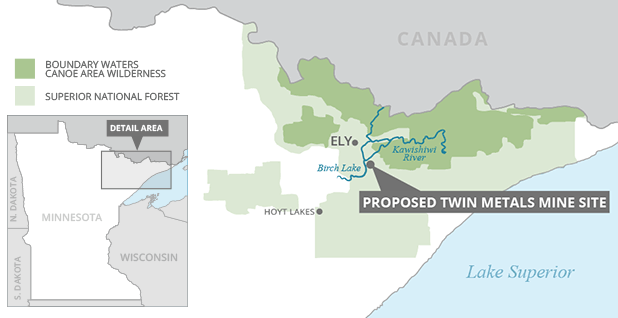 Another mine, proposed by PolyMet Mining Corp., would operate near Hoyt Lakes. Residents fear that copper-nickel mining from the sulfide-bearing rock would create acid waste runoff that could damage water and wildlife. Both Twin Metals and PolyMet Mining complain that their permit applications aren't getting a fair review because of policies they say were influenced and written by environmentalists and lawmakers who don't live in northeastern Minnesota. Many residents in the area agree, expressing antipathy toward government overreach. "We are locals in a rural area being oppressed by the Twin Cities. And it has always been that way, and we're just fed up with it." Joe Baltich told Cusick. Baltich is the third-generation owner of Northwind Lodge and Red Rock Wilderness Store on Jasper Lake, 16 miles northeast of Ely. Baltich and others believe that the mining wouldn't hurt the Boundary Waters. As it stands, in December the Minnesota Forest Service blocked the renewal of federal leases that would allow Twin Metals access to the Superior National Forest to explore mining opportunities. They also made about 234,000 acres of the forest off-limits for development for two years, and will use the time to study whether sulfide mining will hurt the area. "If the study shows unacceptable risk, the Superior Forest will be off-limits to mining for at least 20 years," Cusick reports. If the study is favorable to Twin Metals and the leases are renewed, mining would not begin until at least 2024. The protests and violence in Charlottesville, Va., sparked by the City Council's decision to move a Robert E. Lee statue from a city park, have brought into sharp focus an increasingly contentious issue in Southern cities and towns: what to do with Confederate monuments. 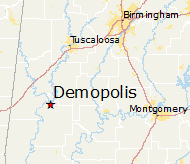 The town of Demopolis, Ala., has grappled with an unusual variant of that question. After a police officer accidentally crashed into the local Confederate statue and knocked it over, locals had to decide whether to put it back up. David Montgomery's Washington Post story about the Demopolis statue is a long read, but provides an excellent look at a town of 7,500 people who thought they had put issues about race behind them—until the crash put it back in front of them. Demopolis defies easy stereotypes. It's not an integrated utopia—whites and African Americans generally live on opposite sides of town, and Mayor John Laney acknowledges that "We’ve got a city of 7,800, but it’s essentially two cities of 3,900 because the demographics is such that we don’t work together. We need to do things to change that." But the police chief is African American and oversees a racially balanced police force, the fire chief and building inspector are African American, and the first African American district attorney in Alabama history was a lawyer in Demopolis. And the townspeople are proud of the progress they've made in integrating their town. "Residents take pride in the fact that, during school desegregation in the middle of the 20th century, Demopolis distinguished itself from many of its Black Belt neighbors," Montgomery reports, using the regional term that first referred to the soil but now more to the people. "Black children and white children were funneled into the same schools, and the habit took. True, an all-white private academy cropped up, but it didn’t last, unlike in other towns where private schools still drain the public schools of white children. Today, Demopolis High School’s student body is roughly as balanced as the population of the town." 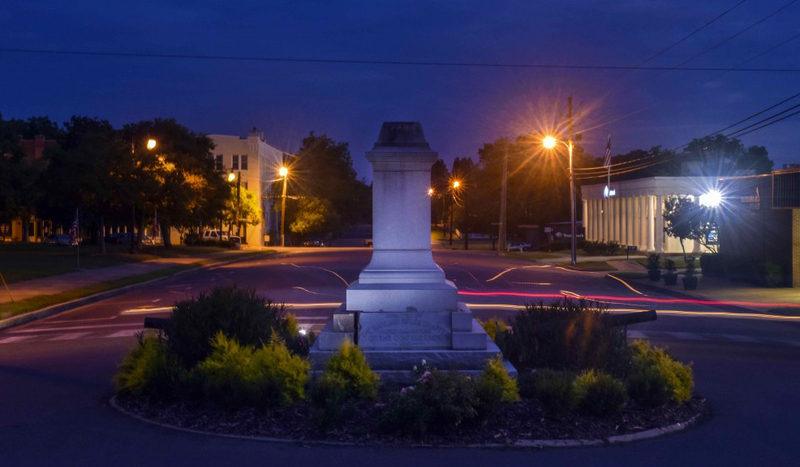 So when the Demopolis monument was knocked down in July 2016, residents worried that the debate over its fate would destroy the town's hard-fought progress. "The last thing I wanted to happen was Demopolis to become a battleground between the Sons [of Confederate Veterans] and the Daughters of the Confederacy and the Black Lives movement," said Mike Grayson, who was the mayor at the time of the crash. "We had worked too hard for too many years." He named a committee of six local civic and business leaders, half white and half black, to study whether the statue should be restored. The public discourse in Demopolis is remarkable for its politeness; neighbors seem to want to preserve the peace, and listened to differing viewpoints calmly when the issue was discussed in a city council meeting in January. "As strong as the convictions were on both sides, they were expressed in a tone of mutual respect," Montgomery reports. But still, some residents were surprised by their neighbors' viewpoints on the statue. As in other communities, some white residents wanted the statue restored because they believe it has historical value. Phillip Spence told Montgomery that the statue "is not anything that glorifies slavery. It’s just to remember people who died. You always want to remember your ancestors." But "to hear white people wax eloquent about the old soldier was a stunning revelation for their black neighbors," Montgomery writes. Former civil rights activist Annye Braxton told him that, to her, the statue means bigotry. "If we are the City of the People, it represents an exclusion of my people. And if we are the City of the People, I think we should be included in the monument. Put Dr. King up there. Put President Obama up there, along with your Confederate soldier." African American barber Reginald Gracie bemoaned the fact that the accident brought the whole issue to the forefront. "You find out the spirit that flows through that monument is still flowing through these people today. All these years you say this should be a model city as far as race relations are concerned, but you want to erect the one thing that keeps us divided?" African Americans' feelings about the statue surprised many of their white neighbors. Kirk Booker, the white operations director of the Marengo County Historical Society, said the revelation was "a little eye-opening." Some white residents couldn't understand why their African American neighbors had never spoken up before if they disliked the monument. Black city council member Charles Jones Jr. said white citizens are learning that "there are some things that we suppressed," and that suppression was one reason Demopolis is able to function as a town where people of different races get along, at least on the surface. House Black History Museum in nearby Greensboro, Ala. But residents are still trying to find their way. "I don’t know what it is about this town, but at the end of the day, we try to make it happen, make it work," Jones told Montgomery. "Yeah, there’s still some socioeconomic oppression going on, but at the end of the day, in this town we try to get along. . . . We’ve seen the all-white town, we’ve seen the all-black town, and we don’t like either of those. We like our 50-50 mix." The issue remains unresolved. The statue is considered to be beyond repair. In April, the council voted to replace it with an obelisk honoring the dead in all wars. But in May 2017, Alabama passed a law forbidding the altering of any public monuments older than 39 years (a law that arguably seeks to specifically preserve Confederate monuments). Some residents said that the law means the statue should be replaced, but others said the law does not apply to a statue that was knocked down before the law passed. The council asked—and is still waiting for—an opinion from state Attorney General Steve Marshall, a Republican appointed early this year. The loss of mid-size farms depopulating rural Iowa, according to an ongoing series in The Des Moines Register called "Changing Iowa." "The quality of life in rural areas is inextricably linked to the vitality of nearby cities, which supply jobs for off-farm income, merchandise, medical care and other services," Executive Editor Carol Hunter writes in an editorial. The reporter on the series, Donnelle Eller, is married to a corn and soybean farmer and lives in rural Iowa. She must drive up to an hour to get to places like a grocery store or a Walmart. So when rural farms shut down or consolidate, businesses in the city where farmers shop also take a hit in profits. Not content to simply write about the problem, the Register is partnering with the Iowa Rural Development Council for a series of forums around the state so Iowans can "discuss the sweeping changes confronting our state and how we can rise to meet these challenges." Here are the first three events, starting at the Register’s Soapbox stage at the Iowa State Fair. On Friday, columnist Kyle Munson will interview young Iowans about their thoughts on making a life and a career in the state, and on Saturday, Tom Vilsack, former Iowa governor and U.S. secretary of agriculture, will discuss rural development and agriculture policy. The old saying goes, "You have to spend money to make money." Some small towns along the totality path of the Aug. 21 solar eclipse are doing just that: sprucing up local facilities, hiring extra law enforcement, and planning festivals that they hope will be big money-makers. They also hope visitors might see what a great place their town is to live and work. 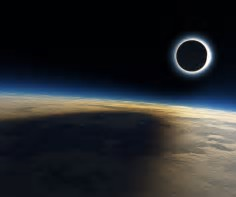 But some cash-strapped towns say they don't have the money to buy in on eclipse fever, and residents worry about committing resources to cater to crowds that may never show up. 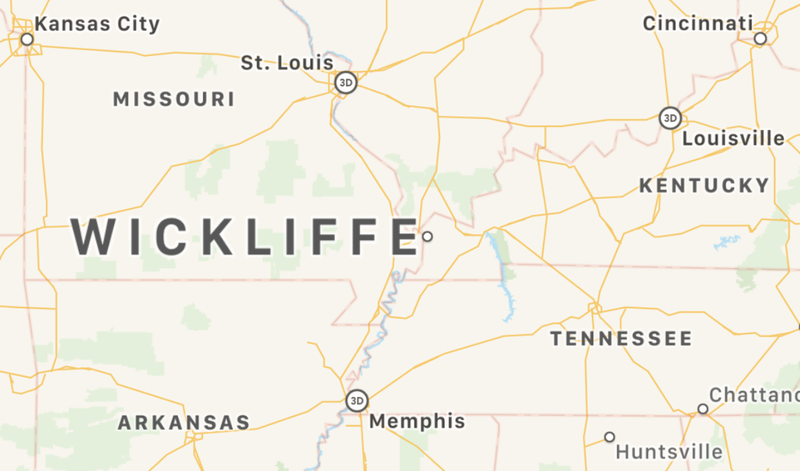 Wickliffe, Ky., where the Ohio and Mississippi rivers meet, is one such community. The shrinking town of 670 has one defunct paper mill that closed in 2015, a few restaurants, and no longer has a police officer or a hotel. Because the town is in the path of totality, Mayor George Lane thought about cashing in on eclipse fever, as Hopkinsville, Ky., has done. 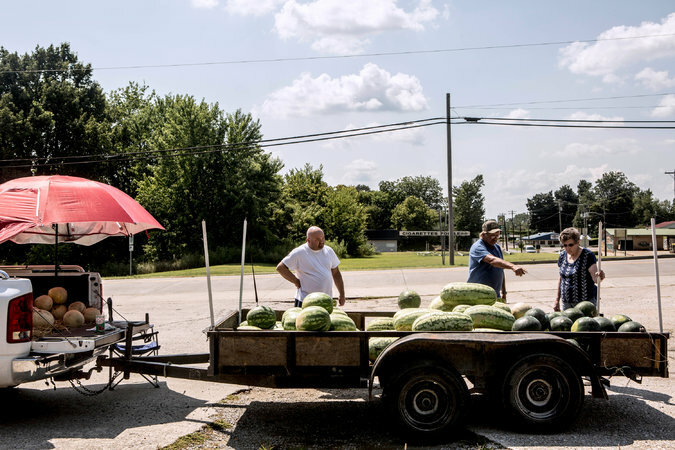 "But the millions flocking to see the eclipse will also mean a logistical headache, a claim on local resources in places like Wickliffe that have few resources left," Campbell Robertson reports for The New York Times. "I kept reading more and more were coming," Lane told Robertson. "We’re just not geared up to handle this." The nearby village of Barlow is similarly down on its luck, with no police officer, hotel, grocery store, gas station, or drug store. But Barlow's mayor, Jo Wilfong, says she's not going to pass up the opportunity. "The city is planning a big barbecue on eclipse day," Robertson reports. "Live music is lined up, and T-shirts are for sale ('I Blacked Out In Barlow, Ky')." The town, having recently voted to allow alcohol sales, "will even have a beer tent," he adds. Wilfong says making money isn't the point of the town's eclipse festivities. "We’re just opening up this area to people who have never been here before, who might see this as a business opportunity or a place to live," she told Robertson. Though there are few businesses in town, "maybe somebody will look around, see a nice, friendly town and decide to open a convenience store," Robertson writes. "That would be the jackpot. It is not impossible to imagine." When the Environmental Protection Agency followed through on President Trump’s promise to repeal the rule defining “waters of the United States” in the Clean Water Act, deputies to EPA Administrator Scott Pruitt told career employees to justify the changes without making any records, report Coral Davenport and Eric Lipton of The New York Times. The move on “WOTUS” was part of a pattern, they report: “Pruitt is taking extraordinary measures to conceal his actions, according to interviews with more than 20 current and former agency employees. . . . Pruitt’s penchant for secrecy is reflected not just in his inaccessibility and concern for security. He has terminated a decades-long practice of publicly posting his appointments calendar and that of all the top agency aides, and he has evaded oversight questions." EPA employees told the Times that Pruitt’s lieutenants told them to produce a new analysis excluding the benefits of protecting wetlands, and “They did what they were told,” said Elizabeth Southerland, who retired last month as a senior official in EPA’s water office. “Southerland and other experts in federal rule-making said such a sudden shift was highly unusual — particularly since studies that estimate the economic impact of regulations can take months or even years to produce, and are often accompanied by reams of paperwork documenting the process,” the Times reports. “The mere fact they are telling people not to write things down shows they are trying to keep things hidden,” Jeffrey Lubbers, a professor of administrative law at American University, told the newspaper. Meanwhile, another EPA spokesperson, Jahan Wilcox, threatened to call "security" on reporters who wanted to see Pruitt while he was on the University of North Dakota campus for a private meeting with farmers, reports Andrew Hoeffner of the Grand Forks Herald.